Is Self-Care in College Possib..
Jane Pauley on Her Mental Heal.. The purchase of a daily coffee might normally be a guilty pleasure, a routine or a financially irresponsible pit stop. Most people do it anyway. Jonny Boucher, founder of Hope for the Day, is taking that regular guilty pleasure and transforming it into something not so guilty — funds put toward suicide prevention and mental health education. 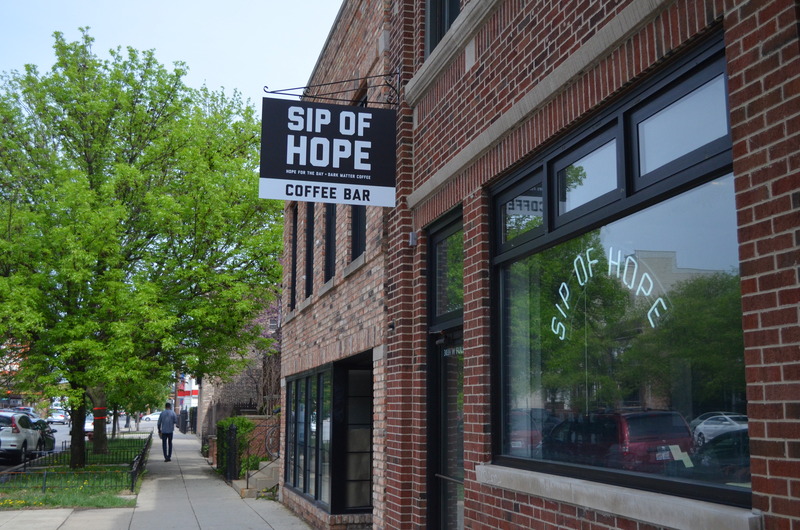 Sip of Hope, a new coffee shop in Logan Square, says it is the world’s first coffee shop where 100 percent of the profit supports suicide prevention and mental health education. The profits fund Hope for the Day — a nonprofit organization that acts to educate people on mental health and normalize the conversation around it. “Arriving at the point of suicidal crisis can stem from many different paths, all of which share a difficulty to communicate and address the psychological impact an experience is causing in someone’s daily life,” writes Hope for the Day on its website. Suicide is the 10th-leading cause of death in the United States, according to the American Foundation for Suicide Prevention. Sip of Hope is Boucher’s way of funding Hope for the Day independently, without having to rely on outside grant money and donations. He wants to take one of the things that people are likely to spend money on — a good cup of coffee — and turn that into a movement. 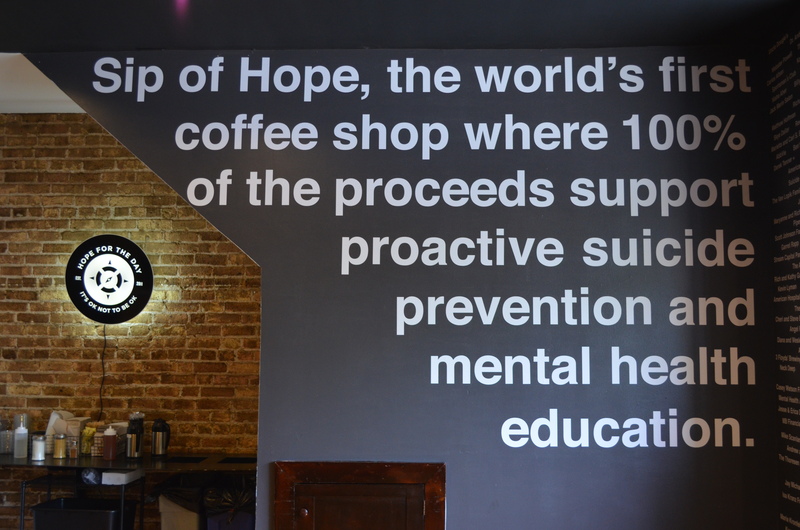 Aside from funding, Sip of Hope is also meant to provide a safe space in which people can seek mental health resources. Hope for the Day doesn’t provide therapy and can’t prescribe medicine. 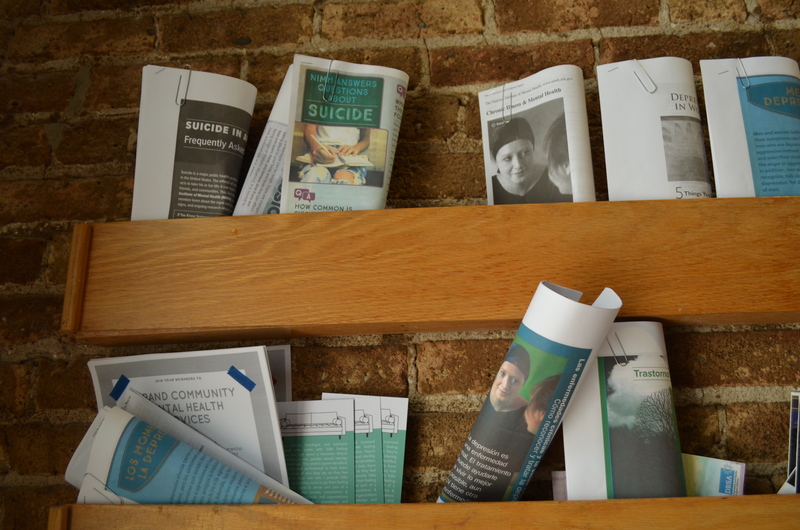 But there is a resource wall holding racks of pamphlets and articles located in the vestibule area of the coffee shop, where people can find information about where to seek professional help as well as educational materials on mental wellness. Even though they’ve only been open for about three weeks, Boucher said they’ve already had to restock the resource wall, which he sees as a good sign. 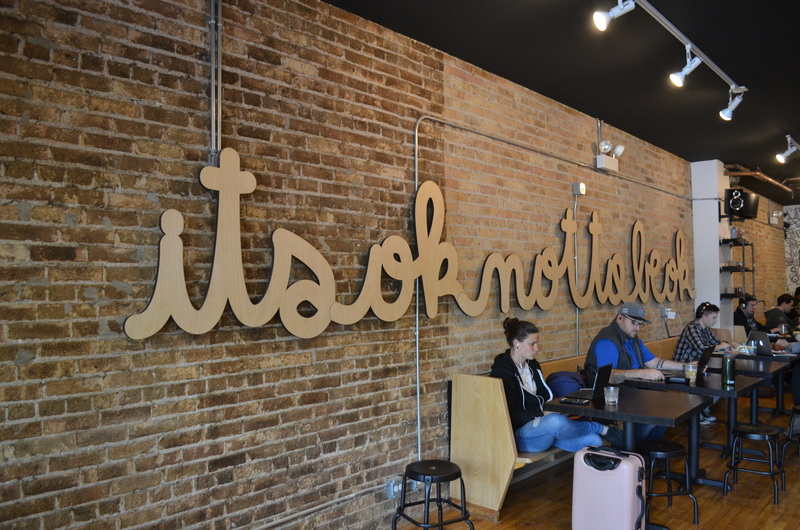 Hope for the Day also provides mental health training sessions at locations across the Chicagoland area. They have a basic one-hour session, a more intense four-hour session and a hands-on, eight-hour session where attendees can learn CPR in case of an emergency. They host a free training session once a month at the Logan Square Library. Hope for the Day aims to work with anybody they can reach — like corporations seeking training for their employees, individuals, first responders and others. Although Hope for the Day has been around since 2011, getting Sip of Hope to open up this month has been about two years in the making. Boucher first came to Dark Matter with the business proposal in the winter of 2016. The two organizations moved forward with the work, fundraising the money to open the shop. Eventually, Hope for the Day raised over $150,000 with the help of Dark Matter. Boucher first started working with Dark Matter in 2013, when Hope for the Day was working on their first art show. Kyle Hodges, who works as the Minister of Propaganda at Dark Matter Coffee doing marketing and collaborations, reached out to them to see if there was any way they could support the event and its cause. Dark Matter did support the event, and the next day, people from both organizations were hanging out at Riot Fest, Boucher said. The collaboration between Hope for the Day and Dark Matter Coffee soon grew into a bag of beans, also called Sip of Hope, which Boucher said was designed to have resources on it. All of this is part of Boucher’s mission: ingraining active suicide prevention into the foundation of his non-profit. In order to make that a reality, he knows they have to find a revenue stream outside of the typical and collaborate with other companies as much as possible, which will help them reach even more people who might need to hear their message. For example, Boucher said they’re “notorious for working with the alcohol industry,” and have designed beer bottles to have resources on them as well. Boucher started Hope for the Day because of the ways in which mental health has touched his own life and those near to him. Boucher’s former mentor in the music scene completed suicide in 2010, and was the ninth person he knew to have completed. Hope for the Day was born a year later. Hodges had a similar experience. His former roommate also completed suicide, and a few months later was when he first heard about Hope for the Day. 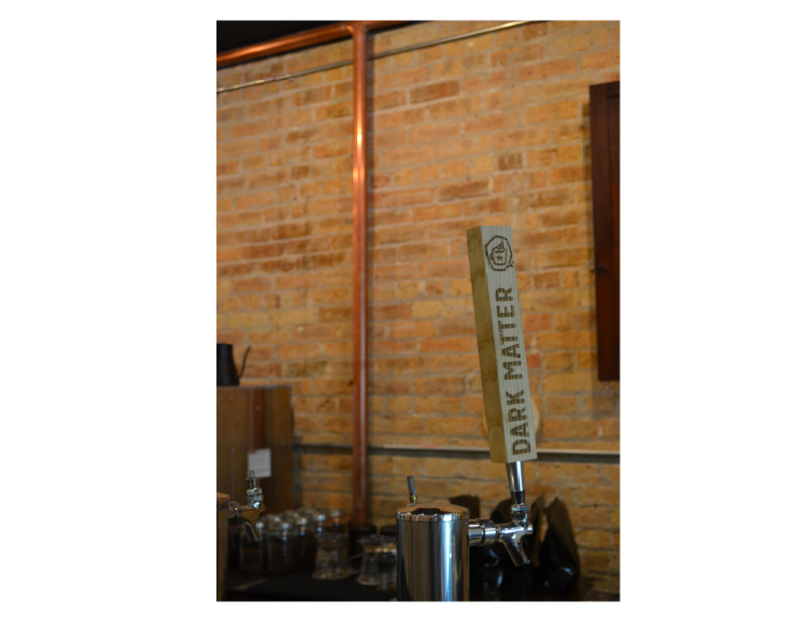 Although Dark Matter is a partner and helps provide coffee, equipment and training on how to run a coffee shop, Hope for the Day is the sole owner and daily operator of the shop. Boucher said they have it set up as a social enterprise, and that Sip of Hope is an LLC while Hope for the Day remains a nonprofit, and the proceeds come in as a contribution. Hodges said that aside from raising money, it’s important to have a physical space where the community knows they can seek safe resources. Boucher said Dark Matter as a company is a good case study for what they hope to instill in organizations they train and work with. He said Dark Matter is in the process of mandating its hiring process, so that new hires are required to complete a mental health education training session. Even if somebody feels they don’t need it or doesn’t have personal connection to the cause, Boucher believes normalizing the existence of mental illness and making spaces to discuss it is one form of active suicide prevention. If you or someone you know is experiencing suicidal thoughts, you can call the National Suicide Prevention Lifeline at 1-800-273-8255 or text “ITSOK” to 741741. To learn more about counseling services at DePaul University visit the student affairs website. To make an appointment you can call the Lincoln Park office at 773-325-7779 or the Loop Campus office at 312-362-6923. You can also call the Illinois Warm Line at 866-359-7953 for peer and family mental health support from Monday through Friday during the work day. For more information about Chicago mental health resources, you can visit the NAMI Chicago’s website. Additional reporting by Marissa Nelson. Header photo by Megan Stringer.